The MPT Searchable Resource Database houses MPT-related resources and allows you to filter by selecting criteria from the drop-down boxes or by entering a keyword in the search box. 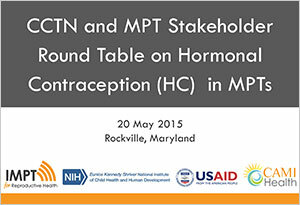 In September 2014, CAMI Health, with support from the Bill & Melinda Gates Foundation and the U.S. Agency for International Development (USAID), convened a technical meeting in collaboration with the Eunice Kennedy Shriver National Institute of Child Health and Human Development (NICHD), to bring together experts in hormonal contraception (HC) with MPT developers to review relevant contraceptive research and discuss its application to the MPT development pipeline. The meeting highlighted a number of challenges and gaps critical to advancing work on combining HC and ARVs in MPTs, as reported in the meeting summary. In follow up, the CCTN and MPT Stakeholder Round Table on HC in MPTs brought together CCTN researchers and MPT stakeholders to further prioritize research gaps and recommendations identified at the September meeting and provide input on the operationalization of research goals. To browse through resources organized by larger categories, please return to the main Resource Center page. The Secretariat’s goal is to provide you with one stop to find all your information on MPTs. If you have resource suggestions to add to our database, please email IMPT@cami-health.org.